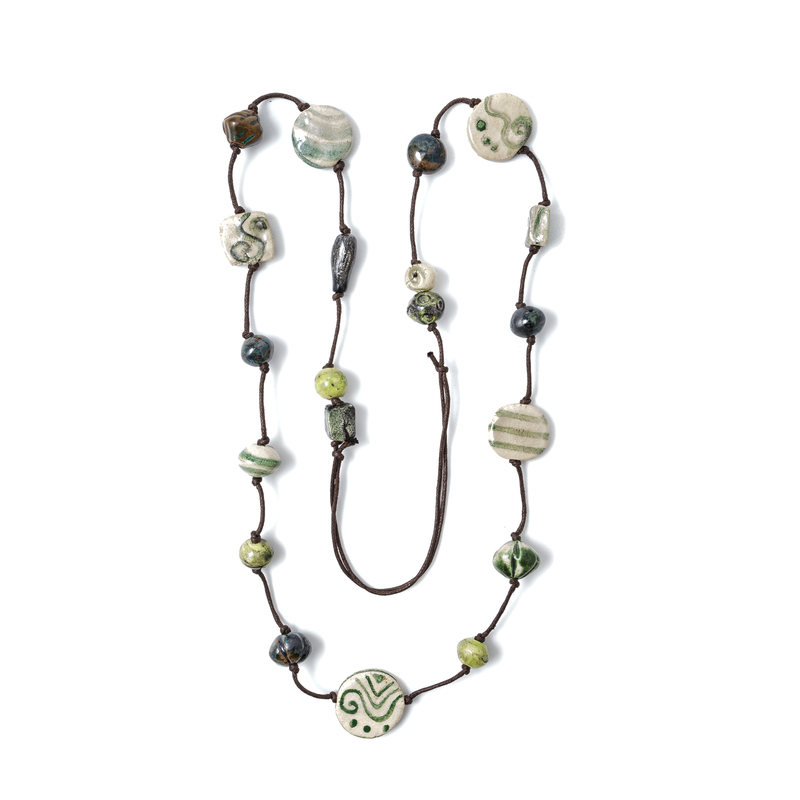 The fine pearls of this sophisticated glazed ceramic necklace, which are decorated individually, evoke the colours of the earth and the sea. 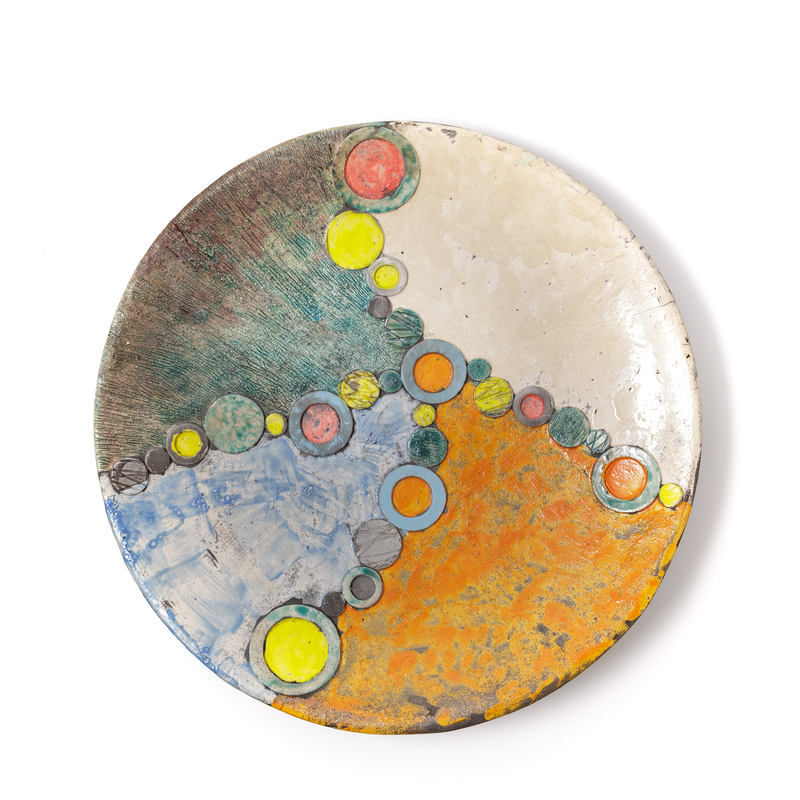 This large raku ceramic plate with irregularly enamelled surfaces is characterised by the circular shape crafted with an exquisite touch and original decoration. Entirely handcrafted with fine technique, this artefact is representative of the ceramist’s distinctive artistic trait. The beautiful shape of this glazed ceramic vase is emphasised by the contrast between turquoise and mustard yellow, embellished with original decorative elements and iridescent enamel reflections. 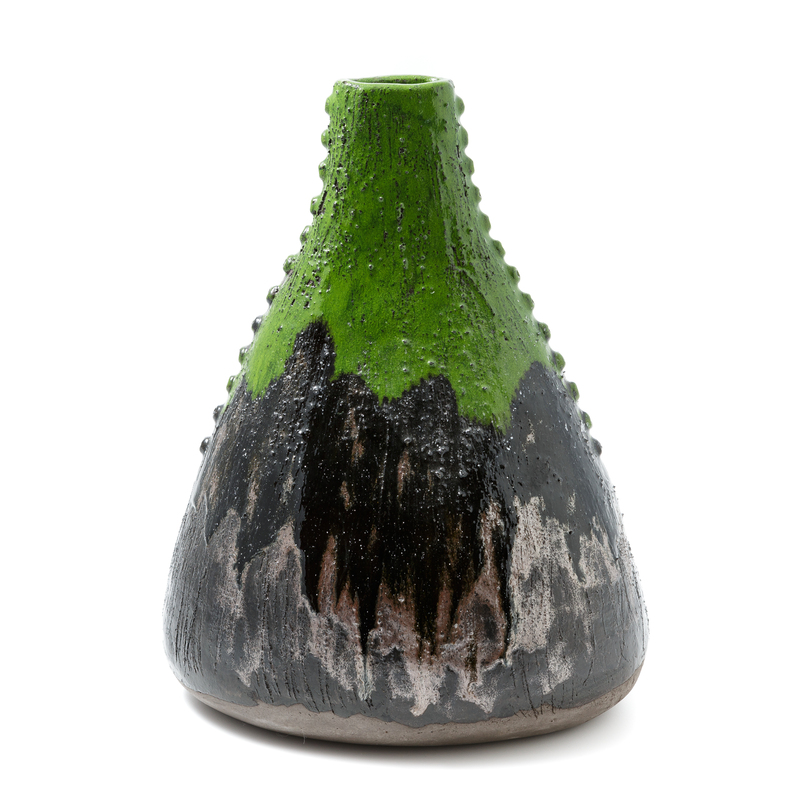 This large, organic-shaped vase is made using only the “a colombino” technique and its engraved and glazed surfaces are enhanced through the use of mottled contrasting vibrant colours. 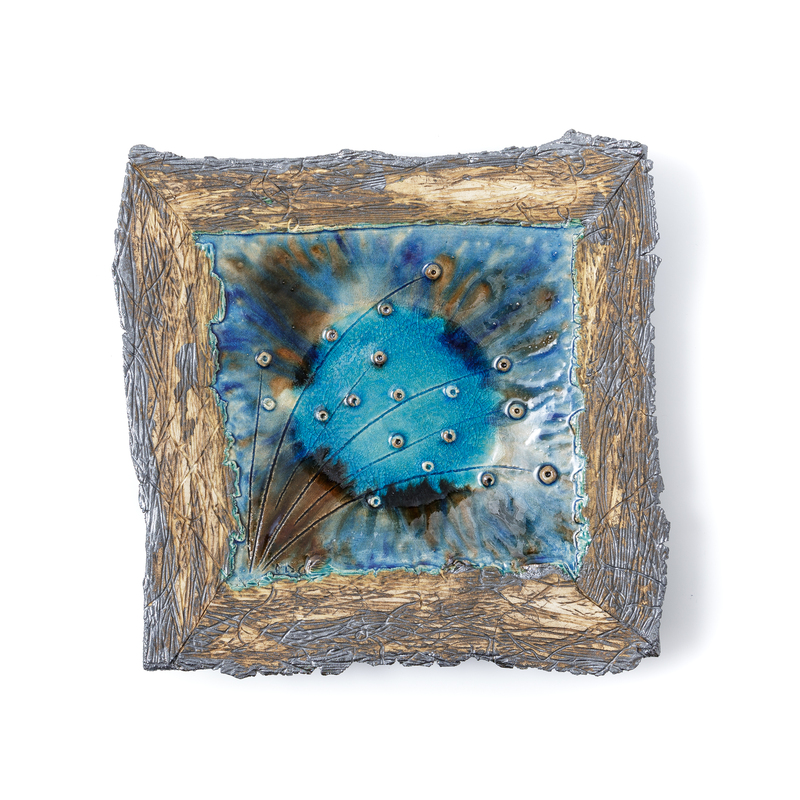 Inspired by the colours of the landscapes of the island, this unique square ceramic plate is decorated with flowers against the background of a bright blue sky. Entirely handmade with personal, refined technique, the artefact expresses the distinctive artistic trait of this ceramist. Eye-catching coloured glazed ceramics, vari-shaped pearls that tempt the observer to touch, combine and choose, are the unique creations of the multi-faceted ceramist Maria Grazia Gavini with her Monili di Mag. After studying at the Art School of Sassari, she chose ceramics as her expressive medium, investigating and experimenting different stylistic solutions and colours that are a tribute to the charismatic nature of the island, which she masters in her vibrant, glazed surfaces. Maria Grazia Gavini is dedicated to crafting her elegant, bright objects in the workshop, which she set up in 2008 in Assemini - a village renowned for its vivid tradition of ceramic craftsmanship - prompted by her own creative world with distinguishing artistic features and sophisticated skill. She displays her works at the main regional fairs dedicated to the local excellences of this craft. The production of this ceramist features a rich collection of jewels in which pearls, finely crafted one at a time, are combined in inspiring and ever-changing different formal and chromatic compositions. In addition to her most known jewellery collection, she produces a line of decorative items, large plates, vases and bowls where shapes and colours are always chosen so as to convey harmonious dynamism with a pictorial trait. 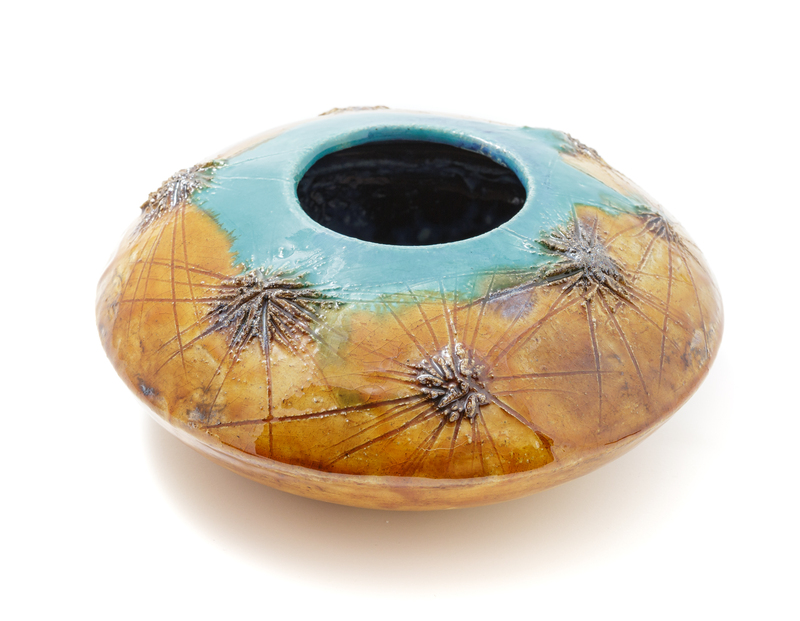 Maria Grazia mainly crafts refractory clay, experimenting novel colour effects with other types of earth. In her continuous experimentation she uses various techniques ranging from plate shaping, “a colombino” shaping and manual plastic molding with subsequent engravings and additions. Decorations are realised with slip, enamels and crystals according to fine colour rendering that is evocative of the colours of the island.